According to an online survey of 8,000 people in 16 countries, including South Korea, 80.3 percent of foreign respondents positively rated the nation’s image. Notably, 34.6 percent expressed a “very positive” impression of the nation, the survey showed. It was jointly conducted by the Ministry of Culture, Sports and Tourism and the affiliated Korea Culture and Information Service. 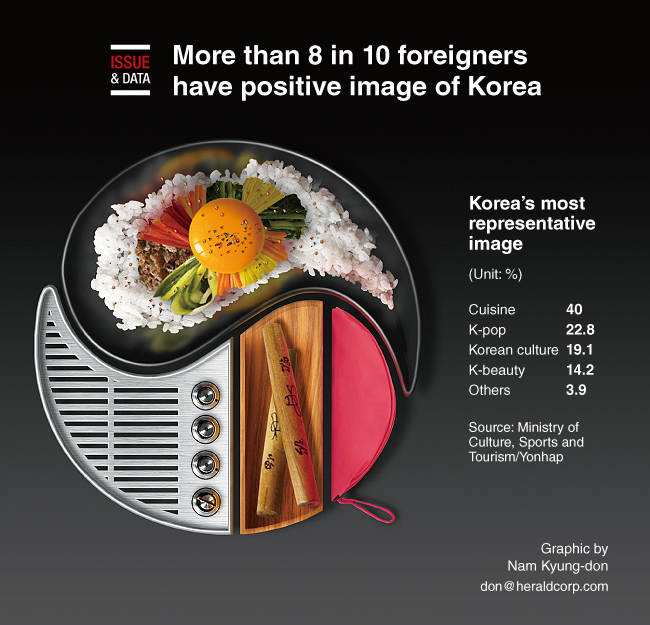 Forty percent of foreign respondents said Korea’s most representative image was in Korean cuisine, 22.8 percent in K-pop, 19.1 percent in Korean culture and 14.2 percent in K-beauty.